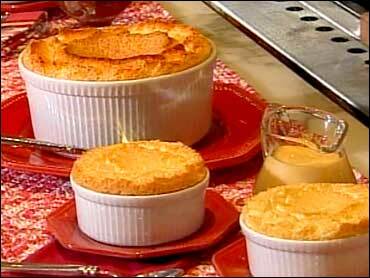 It's a classic treat, but the word "soufflé" throws terror into the heart of many cooks. However, cookbook author and cooking teacher Tori Ritchie says this puffed up prima donna is actually easy to make. Soufflés date back to 18th-century France, and their reputation for being complex and easy to ruin is almost as old. It's really an undeserved reputation. Soufflés are actually quite easy to make. As James Beard put it, the only thing that will make a soufflé fall is if it knows you are afraid of it. There is a soufflé out there for everyone. Savory or sweet, vegetable or fruit, meat or vegetarian, hot or cold. (Cold soufflés, by the way, are called mousses). To make the tomato-basil sauce: core, peel and seed the tomatoes. Cut into small pieces; set aside. In a food processor fitted with the metal blade or in a blender, combine the salt and garlic cloves. Process until coarsely chopped. Add the basil leaves and continue to process to form a coarse puree, scraping down the sides of the bowl. Add the tomatoes and process until a smooth puree forms. Add the olive oil and pepper and continue to process until well blended and smooth. Taste and adjust the seasonings. Set aside. Position a rack in the middle of an oven and preheat to 350°F. In a small saucepan, heat the milk until small bubbles appear around the edges of the pan. In another saucepan, over medium heat, melt the butter. When foaming, add the flour and whisk until blended. Cook, whisking, for 1 minute; do not allow to brown. Gradually add the milk, whisking constantly. Continue whisking, regularly scraping the bottom and sides of the pan, until the mixture thickens and comes to a boil, 2 to 3 minutes. Cook for a few seconds more until thickened and smooth, then remove from heat. Let cool a little. In a bowl, whisk the egg yolks until pale yellow, 1 to 2 minutes. Gradually whisk the hot sauce into the yolks, then add the cheeses, salt, pepper, a sprinkling of cayenne and the Madeira. Stir to mix well. Set aside. Place the egg whites in a large, clean, dry bowl. Add the cream of tartar and, using a clean whisk or beaters, beat until soft peaks form and hold their shape. Spoon about one-fourth of the egg whites into the sauce and, using a rubber spatula, stir gently to blend. Then gently fold the remaining egg whites into the sauce, just until incorporated. Spoon the mixture into an ungreased 1 1/2-quart soufflé dish and bake until puffed and lightly browned, 35 to 40 minutes. Warm the tomato-basil sauce gently over medium-low heat. Remove the soufflé from the oven and carry it immediately to the table before it begins to fall. Spoon onto warmed plates and top each serving with a spoonful of the sauce. Pass the remaining sauce. Serves 4. Adapted from Chuck Williams Collection, "Simple French Cooking," by Chuck Williams (Time-Life Books, 1996). The soufflé dish, a ceramic dish with tall, straight sides, is usually greased and then dusted with sugar (or, for savory soufflés, bread crumbs) to help the batter "climb" the sides of the dish. For some high-rising soufflés, a collar is fashioned out of parchment paper to give more support. To make the pastry cream: in a saucepan over medium heat, warm the milk until small bubbles appear along the edge of the pan. Remove from the heat. In a bowl, whisk together the egg yolks, 1/3 cup of the sugar, the flour, orange zest and salt until pale and well blended. While whisking, slowly add the hot milk. Pour the mixture back into the saucepan and place over medium-low heat. Cook, whisking constantly, until the mixture comes to a boil. Continue to cook, whisking constantly, for 1 minute. Remove from the heat and whisk in the liqueur and vanilla. Pour the pastry cream into a large bowl and gently press a piece of plastic wrap directly onto the surface to prevent a skin from forming. Let cool to room temperature or refrigerate until ready to bake. Preheat an oven to 375°F. Lightly butter a six-cup soufflé dish and dust with sugar. Remove the plastic wrap from the pastry cream and whisk until smooth. In a deep, spotlessly clean bowl, use an electric mixer and beat the egg whites on medium-high speed until they are foamy and soft peaks form when the beaters are lifted. While beating, gradually add the remaining 1/3 cup sugar and continue to beat until stiff peaks form. Scoop about one-fourth of the egg whites onto the pastry cream and, using a rubber spatula, fold in gently to lighten the mixture. Then fold in the remaining whites just until no white streaks remain. Scoop into the prepared dish. Run a thumb around the inside rim of the dish to keep the batter from sticking and help the soufflé rise. Bake until the soufflé is puffed and the top is browned but the soufflé still jiggles slightly when the dish is gently shaken, about 30 minutes. Serve immediately with the crème anglaise. Serves 6 to 8. Adapted from Williams-Sonoma Collection Series, "Dessert," by Abigail Johnson Dodge (Simon & Schuster, 2002). Gelatin is an odorless, colorless, tasteless thickener derived from collagen, a protein extracted from the bones, cartilage and tendons of animals. Two forms are available: powdered gelatin, popular with American cooks, and sheet or leaf gelatin, which is commonly used in Europe. Do not confuse powdered gelatin with the sweetened, fruit-flavored gelatin desserts sold in boxes. Both powdered and leaf gelatin must be rehydrated, or allowed to "bloom," in cool water and then melted before they can be added to a recipe. Prepare four 4-fl.-oz. ramekins by wrapping each one with a parchment paper collar. Cut a length of parchment paper 2 inches longer than the circumference of a ramekin and at least 5 inches wide. Fold the paper in half lengthwise, wrap it around the outside of the dish so that it extends two inches above the rim, and secure with a rubber band. Prepare an ice bath by partially filling a large bowl or the sink with cold water and ice cubes. Pour the water into a saucepan and sprinkle with the gelatin. Let stand until the gelatin softens and swells, 5 to 10 minutes. Stir in the granulated sugar, salt, lime zest, lime juice and egg yolks. Place over medium heat and cook, stirring constantly, until the mixture thickens and the gelatin melts completely, 6 to 8 minutes. Do not allow the mixture to boil. Set the saucepan in the ice bath until the mixture is cool to the touch. Remove the pan from the ice bath and let stand at room temperature. In a large bowl, combine the cream and confectioner's sugar. Using a wire whisk or an electric mixer on medium speed, beat until soft peaks form, 4 to 6 minutes. Add the lime mixture to the cream and, with a rubber spatula, fold together until smooth. Pour the mousse into the prepared ramekins, dividing it evenly. Refrigerate the mousse until it is cold and firm, 2 to 3 hours. Remove it from the refrigerator 20 minutes before serving. To remove the collar, snip the rubber band and gently pull the parchment away from the mousse. Serves 4. Note: This dish contains egg yolks that may be only partially cooked. They run a risk of being infected with salmonella or other bacteria, which can lead to food poisoning. This risk is of most concern to small children, older people, pregnant women and anyone with a compromised immune system. If you have health and safety concerns, do not consume undercooked eggs. Adapted from Williams-Sonoma Collection Series, "Fruit Dessert," by Carolyn Beth Weil (Simon & Schuster, 2004).